Girls are coming to the White House on Tuesday and they are bringing their robots with them. Dozens of kids from grade school to high school will be there for the White House Science Fair, launched by President Barack Obama in 2009. This year,the emphasis is on girls who excel in science, technology, engineering and math (STEM), fields where women are severely underrepresented in the workforce. Shannon O'Brien, 17, was invited to the White House as an honored guest. She wants to be an engineer. If things don’t change, she will be outnumbered by men in the workplace by seven to one, according to 2011 statistics on engineering from the U.S. Department of Commerce. Overall, women only make up 27 percent of the science and engineering workforce, according to the National Science Board, and earn just 18 percent of the bachelor's degrees in both engineering and computer science. STEM, for now, is a boys club. There are a lot of women working hard to make sure that isn't the case when O'Brien and her classmates get older. O'Brien can’t name anything she would rather do than help create buildings as a civil engineer. At 10, her family moved from Belize to the Bronx, where she now attends the NYC Charter High School For Architecture, Engineering and Construction Industries. On the Thursday before the White House Science Fair, she is working with another student, Michelle Smith, also 17, on making a smile. A person smiles in front of a camera. The computer program focuses on a single color, drawn as eight dots on a person’s lips. An Arduino micro-controller translates that into action. A tiny, inexpensive motor pulls the edges of a cardboard mount, causing the attached plastic “lips” to express sadness, surprise or happiness. (It can also smirk). The team, coached by the staff of Iridescent, a non-profit that encourages STEM education, is also working on an eye, in the hopes of creating a moving face. “We have been so busy, we haven’t had a chance to give it a name,” O'Brien said. She isn’t kidding. 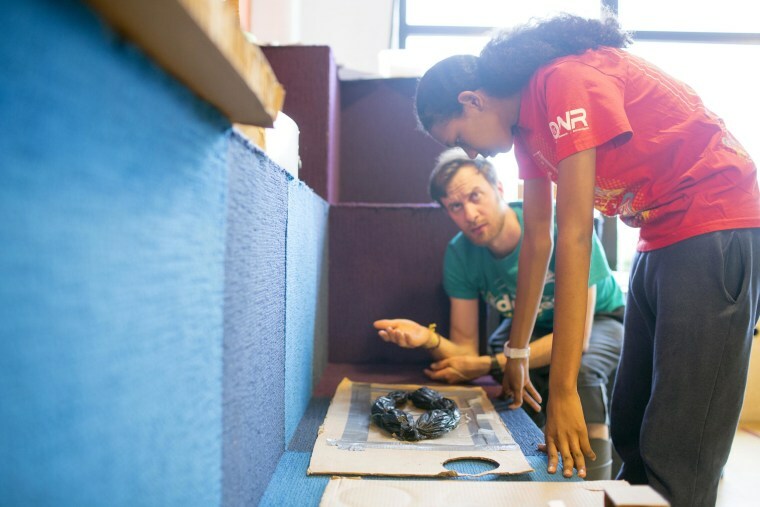 They come into Iridescent, located in a former currency printing facility in the Bronx, twice a week after school to tutor younger kids ranging from third-graders to middle-school students. On Fridays, they get to focus on dreaming up their own inventions. Emily Calandrelli, visiting scholar in Harvard's NASA Tournament Lab and host of an upcoming science show on FOX, made a job out of encouraging girls to pursue STEM careers. Her show, “Xploration Nation: Outer Space,” an educational program aimed at teens, premiers this fall on FOX. Calandrelli told NBC News that her own love affair with science started at Morgantown High School, in Morgantown, W. Va., where she was part of the robotics team. The after-school program was her “main window into cool engineering projects,” a place where science and math were not just theories in a book, but theories that were useful in real life. Her love of stem STEM took her to West Virginia University and then to MIT, where she earned master’s degrees in aeronautics and astronautics. Now, she has her sights set becoming on the next Bill Nye the Science Guy or Neil deGrasse Tyson, with one major difference. “Girls need to see somebody that looks like them talking about science and technology,” she told NBC News. Positive female role models, events like the White House Science Fair, and programs that encourage young girls to pursue STEM send a strong message, she said. The STEM gender divide really takes off in middle school, Jane Margolis, senior researcher at the UCLA Graduate School of Education and Information Studies, told NBC News. “That is where a lot of girls start seeing themselves as not science and math kids,” she said. Not only do they face pressure to be cool from other girls, she said, but they also start caring about what the boys in their classes think. Life might not be easy for an adolescent boy who loves science. But at least he has a male subculture that accepts him. Not only do girls need to see more women portrayed as STEM experts in popular culture, they also need teachers to recognize when there is a gender imbalance in the classroom. The idea that STEM is a boys club can take hold early, for teachers and students, creating barriers for women later on. At the Iridescent in Bronx, Paige Teamey, 33, tries to pass on her engineering knowledge to O’Brien and Smith, who in turn help younger girls draw up blueprints for machines complex enough to confuse many adults. O'Brien is excited about her first trip to Washington D.C. and nervous about getting the project done in time.